The Olympia was one of the first steel and steam warships of the United States Navy and is the oldest steel warship in the United States Navy still afloat. She was a transitional ship as the Navy entered the modern age and her design was revolutionary for her time. Displacing 5870 tons and with a length of 344 feet she was She was powered by reciprocating steam engines and capable of 20 knots. She had twin revolving turrets which housed her main battery of four 8 inch guns and mounted a secondary battery of ten 5 inch guns which protruded from her superstructure on the main deck. 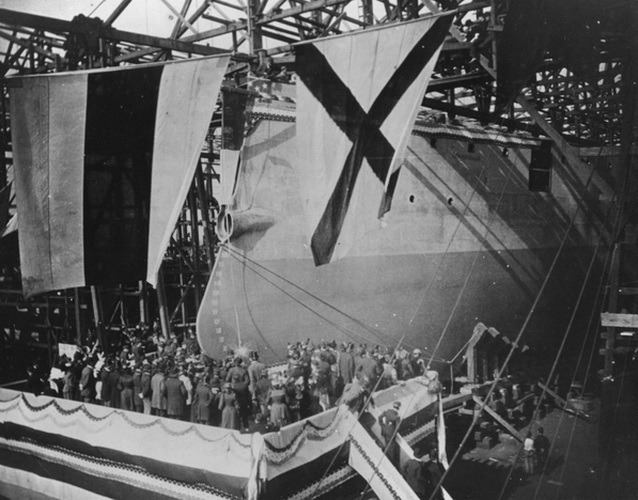 She also retained sails as part of her design and was the first US Navy ship with a refrigeration plant and ice making machines. 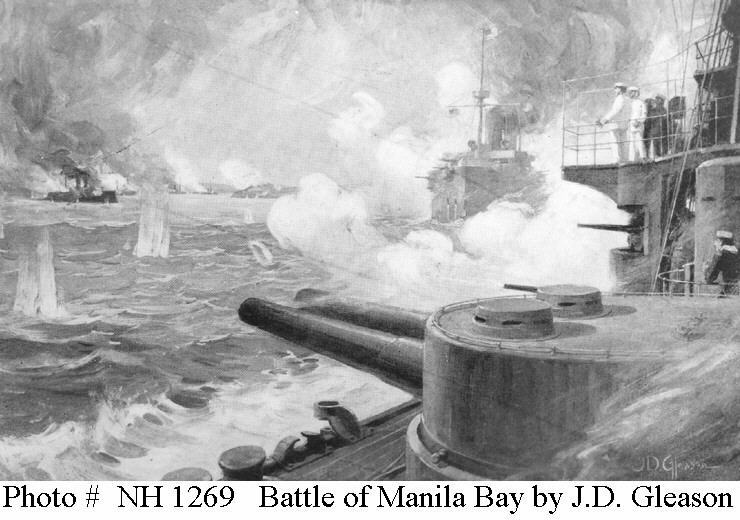 She was the Flagship of Admiral Dewey at the Battle of Manila Bay during the Spanish American War and her last mission was to bring the body of the “Unknown Soldier” back from France following the First World War. The launched on November 5th 1892 and commissioned on 5 February 1895 Olympia was decommissioned for the final time in on December 9th 1922. She would continue her US Navy career in an inactive status after being reclassified as a miscellaneous auxiliary. 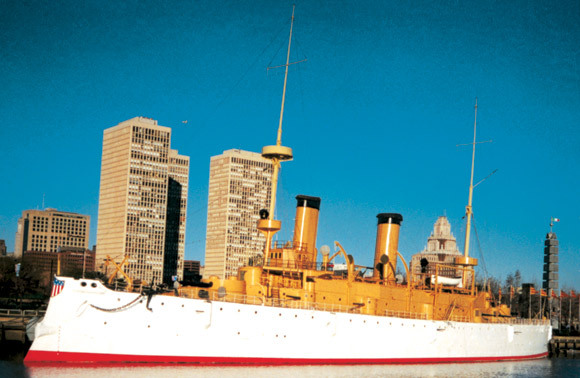 She remained as a Navy asset until she was acquired by the Cruiser Olympia Association on 11 SEP 1957 and was classified as a National Historic Landmark on 29 January 1964 and transferred to the Independence Seaport Museum in January 1995. The ex-Olympia is a national and maritime history treasure. There are but a handful of ships for that era that still remain. The Imperial Japanese Battleship Mikasa, Admiral Togo’s flagship at the Battle of Tsushima in 1905 is outside the Naval Base of Yokosuka Japan http://www.japan-i.jp/explorejapan/kanto/kanagawa/miurapeninsula/d8jk7l000002rn1h.html. 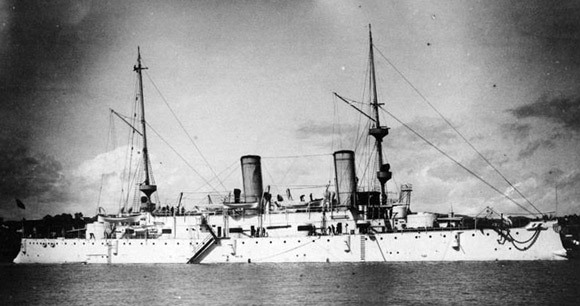 The Russian Cruiser Aurora is moored in Petersburg http://www.aurora.org.ru/eng/ and the Greek Armored Cruiser Georgios Averof http://www.hnsa.org/ships/averof.htm are the only ships of that era remaining. Olympia is in dire need of dry-docking and major repairs to her hull. Despite Federal Government regulations and sound maritime practices which stipulate that museum ships should be dry-docked and repaired at the minimum of every 20 years the Olympia has not been dry-docked or repaired since 1957. She has numerous patches and her caretakers keep constant watch on her to ensure that no leak develops that could sink her. Additionally water now leaks through her decks into her hull causing further problems with rust and hull deterioration. The Olympia is a National Historic Landmark listed on the National Register of Historic Places (1964), a National Historic Engineering Landmark (1977), and National Historic Maritime Landmark (1988) and was awarded “Official Project” status of Save America’s Treasures program (1999). She will be closed as an attraction on the Philadelphia waterfront on November 22nd as the caretakers and the Navy determines her fate. Ultimately the Navy will have the final say in Olympia’s fate; even so efforts need to be made to enlist private and corporate sponsors to help save this treasure. As of the present time these efforts have been unsuccessful. The “Friends of the Cruiser Olympia” http://www.cruiserolympia.org/ as well as former Secretary of the Navy John Lehman and former US Representative Curt Weldon are leading the charge to see Olympia restored and reopened. 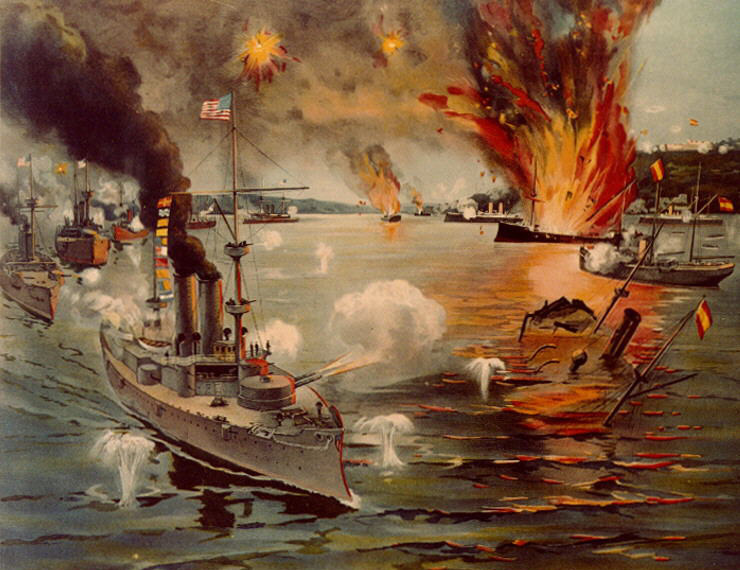 Olympia is not the first US Navy historic ship to be in such dire need. 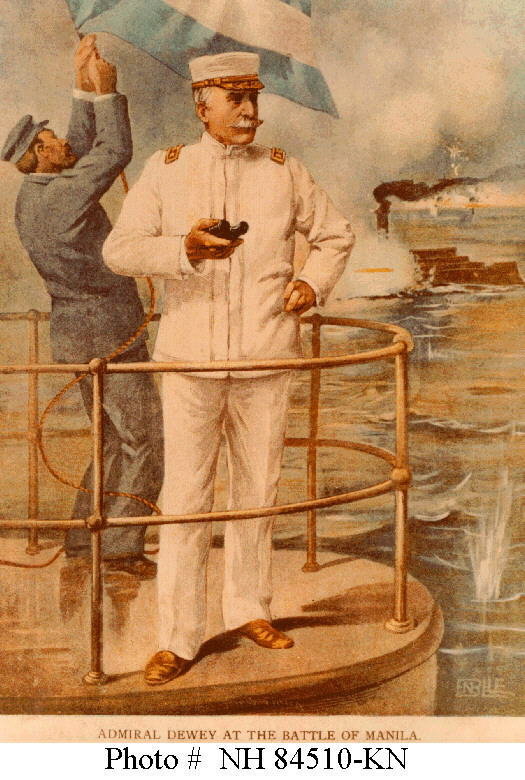 The first was the USS Constitution which was going to be broken up in 1830 until the public inspired by Oliver Wendell Homes’ poem elicited the money needed to repair that ship which was again threatened in the 1920s and was saved by a private-public endeavor urged by the Secretary of the Navy Curtis D. Wilbur which included a drive where children contributed thousands of dollars of pennies to the restoration effort and where prints of “Old Ironsides” were sold for .50 each. Certainly it will take a creative effort to save Olympia and preserve her for history and those Americans that come after us. I go to Baltimore to see an Orioles game on October 1st and may take a short trip to Philadelphia to visit the Olympia and if I do I will do an update with my own photos.